You are here: Home / Blog / Well Maintenance / Space Age Water Testing? Imagine being able to test water in parts of the world where temperatures are above 77 degrees–like Africa and Asia. And at a relatively inexpensive price point. No expensive lab equipment or other heavy materials to carry into remote area. Plus, it can be used in places where live now. The results of the tests are uploaded to a database. The database contains GPS information. Then, using a smartphone app, you are able to check the database for safety based on your current location. It looks like this may be possible at some point down the road. Beta testing is going on right now. According to this article, technology developed for NASA’s Space Station is being re-purposed for to map the quality of water around the world. The water is incubated at ambient temperatures. 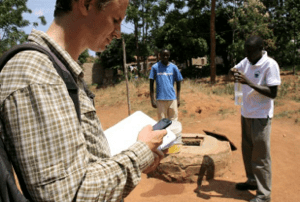 After the incubation period, the water is photographed and uploaded to the database where it is categorized and made available to the smartphone app. If you are looking to have your drinking water tested now to make sure it is safe and healthy to drink, check out our Bang-for-the -Buck Essential Indicators Water Test. Even if you don’t order the test, you can learn about how Essential Indicators testing gives you the information you need to determine the health and safety of your drinking water at a very reasonable investment. https://drinkingwaterspecialists.com/wp-content/uploads/2016/12/dws-with-girl-392x72.png 0 0 Mike Beek https://drinkingwaterspecialists.com/wp-content/uploads/2016/12/dws-with-girl-392x72.png Mike Beek2013-08-20 23:06:422014-05-28 12:14:07Space Age Water Testing? Wyoming Commission Considering Publishing Baseline Water Test Texas Town is Running Out of Water!